How we distribute our work to the general public. Our work is communicated in a range of ways including the use of publications, conferences, courses meetings and through the media. For current news stories see the 'news' section of this website. Examples of other types of media coverage are included here, and will be updated as soon as new publications become availaible. 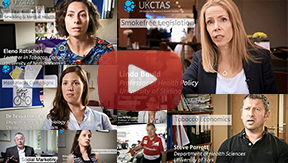 This is a playlist of videos which features a number of our applicants and research teams who have taken part in other organisations' work. Professor Linda Bauld recently spoke to an independent radio station in Scotland about cutting down to quit and tobacco control policy.